At the 2014 ITTF Slovenian Para Open in Lasko, the singles duels concluded in big style. More than 300 players are in duty, with 36 countries participate. It makes 11th Open one of the biggest European FA40competition with Paralympic winners, World champion and European champion present in the hall. In Men’s singles Class one event Robert DAVIS of Great Britain booked top place and justified his high rankings. He beat Andrea BORGATO in the final. Paul DAVIS of GBR and Jean Francois DUCAY of France played in the semis. In Men’s Singles Class 2 Goran PERLIC of Serbia was in charge for biggest upset. He beat top seeded Fabien LAMIRAULT of France in semi final on his way to the gold. Vincent BOURY of France was runner up, after he beat Jan RIAPOS in the semis. In Class 3, Thomas SCHMIDBERGER of Germany won gold. In the final he beat Florian MERRIEN of France. Thomas BRUCHLE and Jan GUERTLER, both from Germany suffered defeats in the semi final. Abdulah OZTURK of Turkey was next in line to justified his high seeded position. In the final he beat Maxime THOMAS of France. Nesim TURAN of France and Krszyszto ZYLKA of Poland lost in semis. Valentin BAUS in Germany upset the rankings in Class 5. He won gold, after success against top seeded Tommy URHAUG of Norway in semi final. In final Germany’s player beat Mitar PALIKUCA of Serbia. OALIKUCA overcame Gregory ROSEC of France previously. In Class 6 Alvaro VALERA of Spain succeeded against Peter ROSENMEIER of Germany in the final. Bastien GRUNDELER of France and David WETHERILL of GBR clinched bronze. In Class 7 William BAYLEY of GBR beat Jordi MORALES of Spain to secure top place at the medal rostrum. Jean Paul MONTANUS of Netherlands and Throsten SCHWINN of Germany shared third position. Andras CSONKA brought gold for Hungary. He beat Emil ANDERSSON of Sweden at the ultimate stage. Richard CSEJTEY of Slovakia and Mathieu LOICQ of Belgium shared third position. Iurii NOZDRUNOV of Russia in Class 9 beat Ronald VIJVERBERG of Netherlands in the final. In semis they overcame Juan Bautista PEREZ GONZALES of Spain and Tahl LIEBOVITZ of USA. 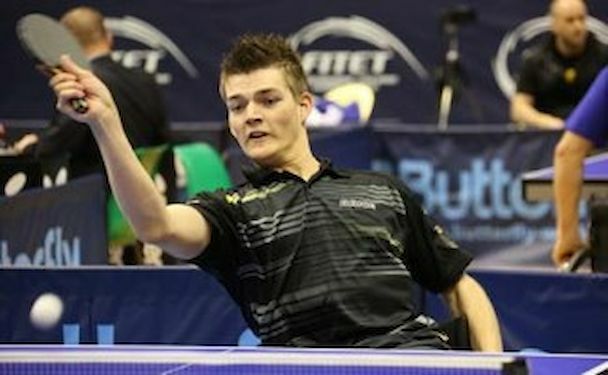 In Class 10 Denislav Stefanov KODJABASHEV of Bulgaria beat top seed Jose Manuel RUIZ REYES of Spain in the final and seeded no two Bas HERGELINK of Netherlands in semis. Mateo BOHEAS of France reached bronze. In the final of the Class 11 Pascal PEREIRA-LEAL of France beat top seed Peter PALOS of Hungary. In semis played Eduardo CUESTA of Spain and Florian VAN ACKER of Belgium. In Women’s Singles Event in Class 1, Russia’s Nadejda POUCHPACHEVA won gold. She overcame Doeta BUCLAW of Poland in the final and Clara PODDA of Italy in semis. Rena MC CARRON – ROONEY of Ireland won other bronze. In Class 2 Andela MUZINIC of Croatia beat Michela BRUNELLI of Italy. In semis they halted the progress of Helena DRETAR KARIC of Croatia and Jane CAMPBEL of GBR. Borislava PERIC RANKOVIC of Serbia justified her rankings in Class 4-5. She beat her teammate Nada MATIC in final. In semis they overcame Sandra MIKOLASCHEK OF Germany and Ingela LUNDBACK of Sweden. Well known Sandra PAOVIC of Croatia won gold in Class 6. She beat Raissa TCHEBANIKA of Russia. Fatma FATTAKHOVA of Russia and Katarzyna MARSZAL of Poland lost in semis. Kelly VAN ZON of Netherlands is the winner in class 7. She overcame Giselle MUNOS of Argentina in final. In Class 8 Thu – Françoise KAMKASOMPHOU of France succeeded to the gold. She accounted for Juliane WOLF of Germany in the final. Elena LIVENKO of Russia and Szofia ARLOY of Hungary played in the semis. In Class 9 Karolina PEK of Poland overcame Olga KOMLEVA / GORSHKALEVA of Russia at the final hurdle. Bruna COSTA ALEXANDRE of Brazil beat Mirjana LUCIC of Croatia in the final of Class 10. LUCIC beat Sophie Amanda WALLOE of Denmark in semis. In Class 11 Krystyna SIEMIENIECKA of Poland beat Japan’s Maki ITO to secure the title. The team’s Event started today . There are 125 teams in the events.